Main Street Marion is proud to present Oktoberfest as a part of our First Friday Downtown Celebrations event series. Main Street Marion’s Oktoberfest commences this Friday, October 2nd, at 4 p.m. in the 3rd Street Courtyard, 119 E 3rd St. 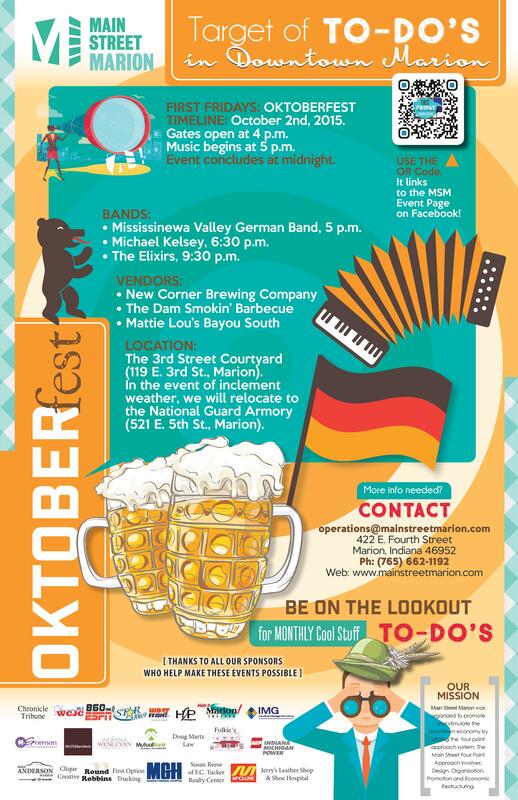 Enjoy a German-inspired dinner by the Dam Smokin’ Barbecue, German Chocolate Waffles by Mattie Lou’s Bayou South, tasty brews by New Corner Brewing Company, and themed entertainment & live music for all ears! Closing the night will be a high octane set from the Elixirs, one of the Midwest’s finest original American Rock & Roll bands! The Elixirs will begin their set at 9:30 p.m. fusing genres of alternative country, roots country, psychobilly, and cow punk. The Elixirs will have no problem keeping the party going until midnight! Read more: www.theelixirs.com.